It’s been a few weeks, I know. First it was due to vacation. Then, well, I should say, now I’ve been sick. All week. Like, can’t get out of bed during the day because I was up most of the night hacking up a lung. I got ill the last night of my Pacific Northwest adventure (more on that adventure another time, or two). I know exactly when it hit me. I was driving on the 104 in the Olympic Peninsula on the way to the ferry for our return trip to Seattle when it hit. I thought my throat was scratchy from the pretzels and chips I was munching on during the 2 and a half hour trip from Forks, WA to Kingston, WA where we’d pick up the ferry across the Puget Sound. This is me, resting, er, taking an iPhone self-portrait of me pretending to be resting while on the ferry. I wish I could sleep that peacefully now. There I was. On the ferry. Coughing. I decided to lay back and try to relax for the 30 minute trip, concentrating on not coughing. "Man, I ate too much of the Munchies Mix," I remember telling my auntie once we checked into our hotel in Sea-Tac. Yesterday, I slept ‘til 1:30pm, getting up only because I had to take my fur child to her grooming appointment. I used the opportunity to make a quick stop at the grocery store. My appetite has been lacking this week, but I knew I needed something high in protein and meat didn’t sound good. Which is surprising coming from this confirmed meat-eater. I love mushrooms. 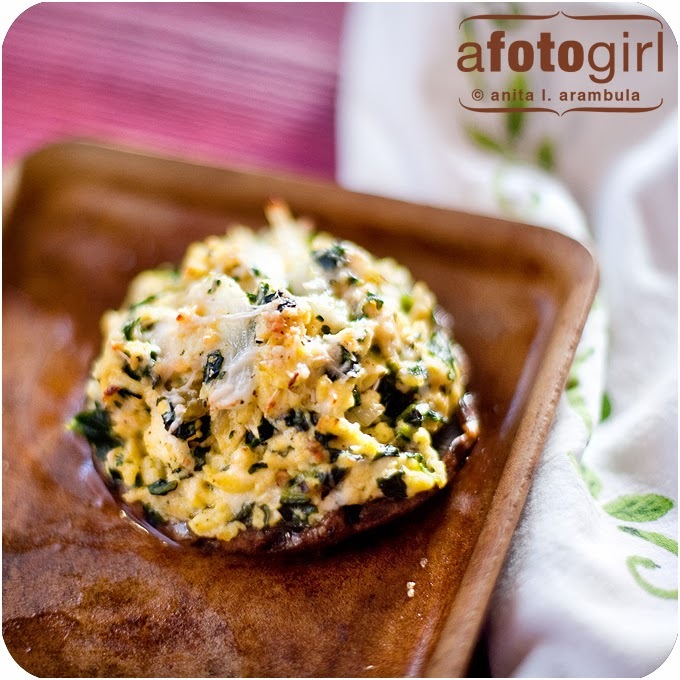 In fact one of my favorite appetizers to take to parties is sausage stuffed crimini mushrooms. It’s a hit. Every time. Sausage didn’t sound good. 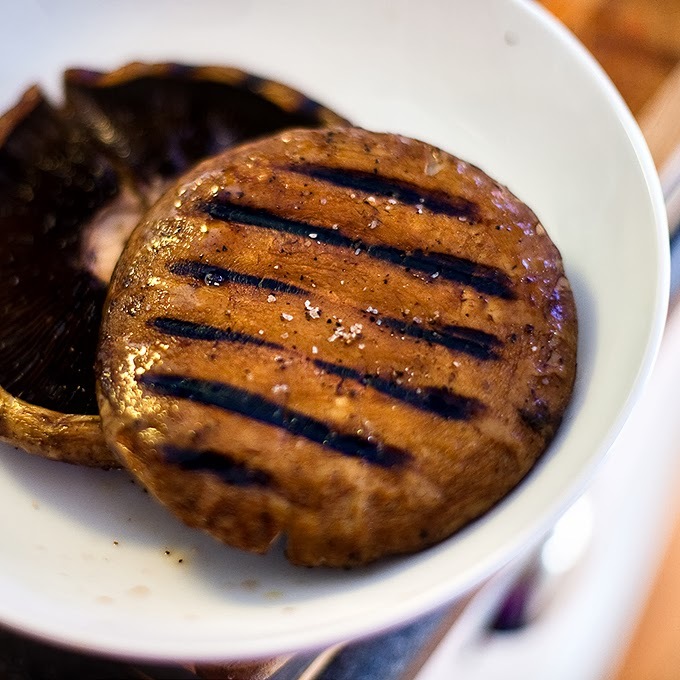 But mushrooms did and the giant portobello’s on sale at the market looked great. 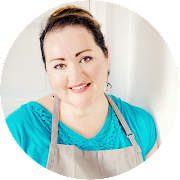 As a single foodie living alone, I often find that many of the recipes I want to write about means I’m eating it for dinner, lunch, dinner and sometimes even lunch again. It gets kinda boring. The lovely thing about this recipe is that it’s perfect as a generous portion for one or paired with toast and some hash browns, a good recipe for two. This makes me happy. It’s super simple and fast which is great because I didn’t have much energy. Don't they look yummy? I didn't have the energy to fire up the grill and go outside. I know some folks don't like grill pans. They complain you can't get a good char. Yeah, right. I love mine. And look at those lovely grill marks. 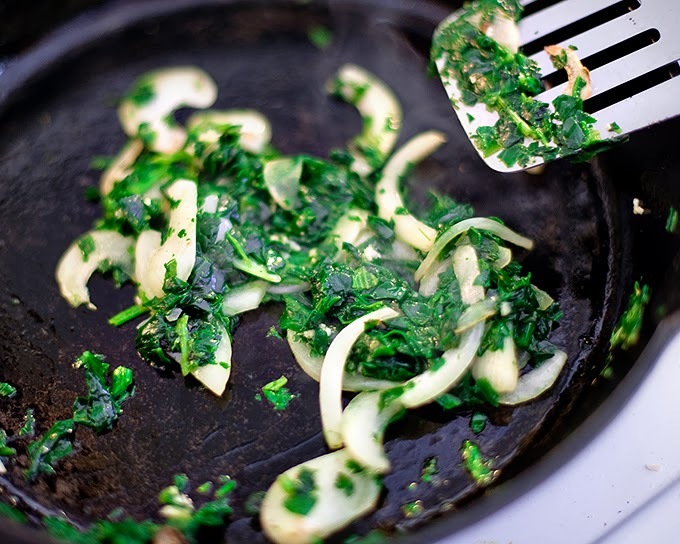 Heat a little olive oil in your trusty cast iron skillet. You're gonna sauté the onions, a little garlic and some spinach and you'll smile, like I did, from the fragrance filling your senses. Mmm-mmmm. And a note on spinach. Being that I'm single, I often rely on good quality frozen veggies because I don't always get through an entire bunch of anything before it goes bad. I am a huge fan of Trader Joe's Chopped Frozen Spinach. Trust me, I've tried lots. But the TJ's variety is frozen loose leaf and not in chunky blocks and is quite yummy. Goodness gracious do I love eggs! And I love 'em soft scrambled (brown tinged eggs away with you!). Seriously, a little sour cream and some green chilis in there and the creamy goodness is simply heaven. Come together! Right now! 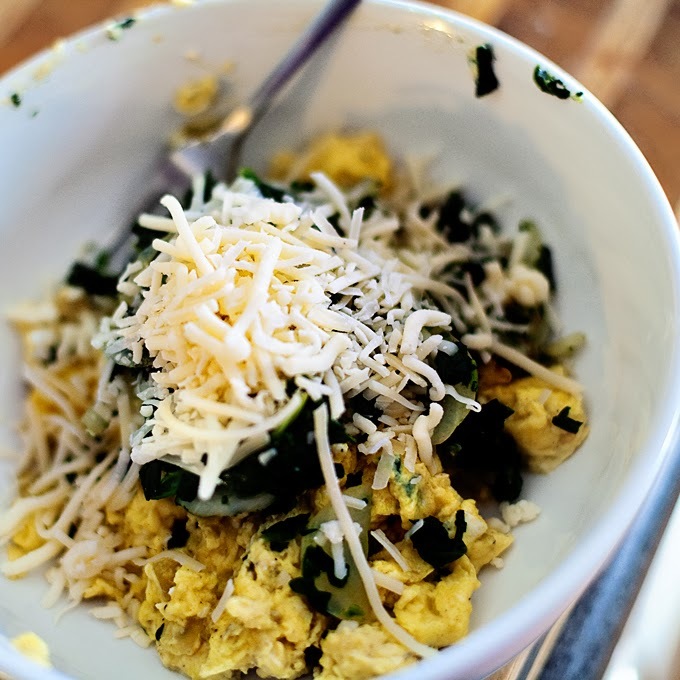 Eggs, spinach and my favorite cheese mixture. Oh, yeah baby! And not wanting to sound like I'm particularly promoting Trader Joe's but I love Trader Giotto's Quattro Formaggio (a shredded mix of parmesan, asiago, fontina and mild provolone cheeses and it's also great in quesadillas and pizzas). Cuz, seriously, I think this has become my new favorite breakfast. Of course, since I slept all day, it was actually dinner time. No matter. It was delish and even with the snapping of the few pictures along the way, beginning to end this took all of about 30 minutes. Heat a grill pan to medium hot. Brush olive oil on each side of the mushrooms. Season with salt and pepper on both sides. 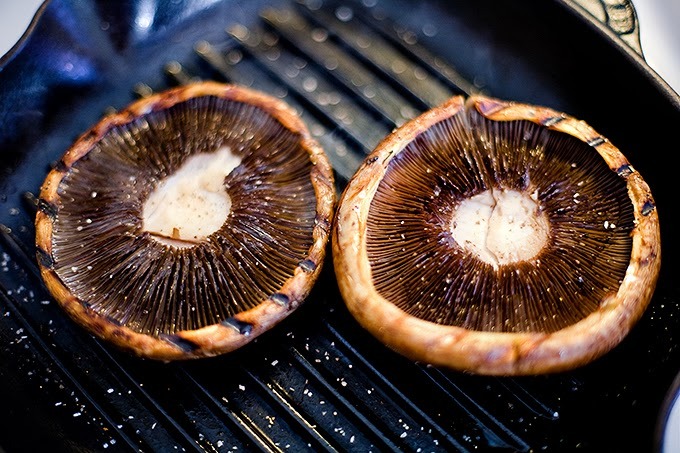 Place on hot grill pan and cook for 6-8 minutes on each side or until slightly charred. Remove from grill and set aside. Heat a sauté pan to medium hot. Add 2 teaspoons of olive oil. Add onions and cook until translucent. Add garlic and stir to keep from burning. Add spinach and stir to heat through. Remove and place in a bowl. Wipe out pan and return to heat. Add 1-2 teaspoons olive oil. In a small bowl, gently beat eggs, sour cream and chilies until combined. 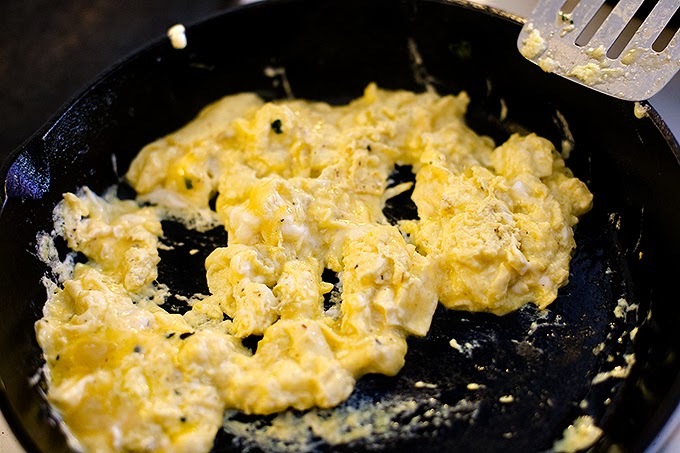 Add to pan and soft scramble. Cook until eggs have just set. 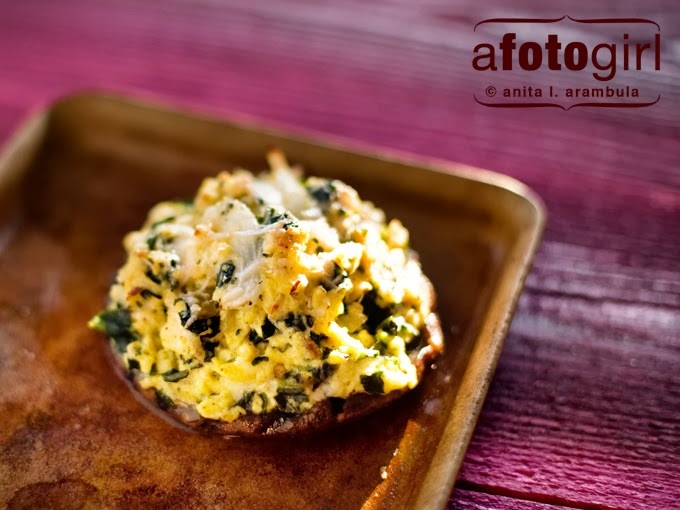 Remove and add to bowl with spinach. Add cheese. Stir to combine. 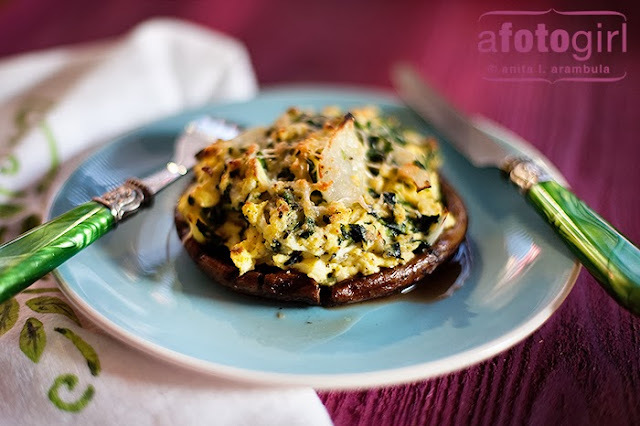 Fill each mushroom cap with the egg mixture. Top each with the parmesan cheese and place on an oven safe pan. 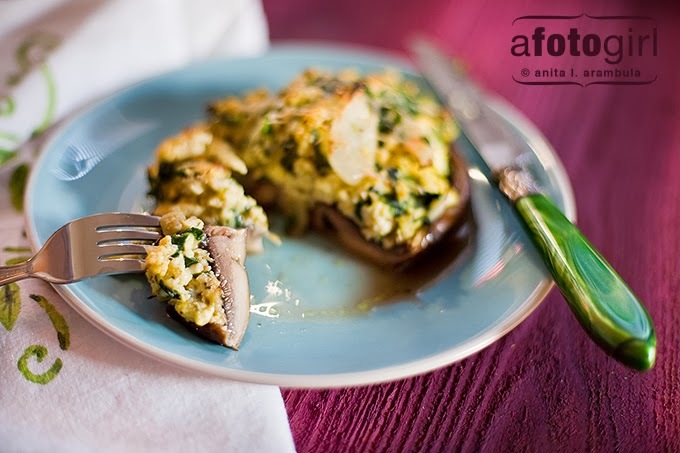 Place under the broiler or in a toaster oven for 5-8 minutes or until cheese is bubbly and parmesan has lightly browned. Enjoy immediately.